Despite all the gloom and doom, there are still lots of mule deer throughout the American West. Finding and taking "any" buck isn't really all that big a deal in a whole lot of places. But a big buck, ah, there's the rub. Big mule deer are scarce--and those that live to become big are much warier than the mule deer we read about. Even though modern mule deer grow ever more wary, they are probably less switched-on and easier to stalk than whitetails. But this depends on the country and how the wind is blowing. Sometimes the terrain and cover allow a close approach, and sometimes not. To me the "best of the best" cartridges for elk are the 8mm Remington Magnum and the fast .33's from .338 Winchester on up. All shoot flat enough for the longest shots that should be taken on elk, and all have the frontal area, bullet weight, and energy to take elk with authority--with any well-placed shot from any angle. Caliber alone isn't the whole story. 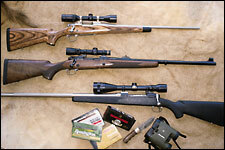 An ideal elk rifle should be fairly portable, because elk hunting is extremely hard work. Synthetic stocks and weatherproof finishes are good ideas any time you go into the mountains in the fall, and of course the rifle will wear a good scope. Elk are huge targets, so lots of power isn't essential. My old .338 wears a fixed 4X, enough power for elk even at long range. But it's a variable-power world. If you prefer something between 11â„2-6X and 3-9X, just keep the scope turned down to no more than 4X until you want more magnification.